Threading a loom is also called "warping the loom" and takes patience and care. You can thread the loom from back to front or front to back, using the simplest of looms or the most complex. You’ll learn here to warp a four-harness loom from the back, but you can use the same basic principles to thread a simpler loom or work from the front. Choose a strong yarn of wool, cotton, linen, silk or synthetic for the warp threads and calculate how much you’ll need for the weaving pattern. A weaving pattern will tell you how much yarn you’ll need, or you can calculate for an original design by multiplying the width by length, adding on enough for loom waste, selvedges, shrinkage and mistakes. Remember that you’ll need yarn for the weft too. Wind the warp threads onto a warping board, following a path made with string or cord twice the length of your intended warp. Make sure to cross between the end peg and adjacent peg to keep the threads in sequence. Tie the threads in bundles to keep count. Once done, cut the warp at the last peg and chain off the warp by looping it hand over hand as in a crocheted chain. Transfer the warp threads from the warping board to the loom. Put the chain of warp thread on the suspended lease sticks, keeping the cross intact. Spread the warp threads evenly throughout the raddle. Attach the warp threads to the back beam of the loom and roll them up, inserting newsprint to keep the layers of warp separate. Thread the heddles on the loom according to the weaving pattern or design you’re using. Count the heddles to center the warp and thread from the center, left or right, using a threading hook or your fingers to pull the warp threads through the eyes of the heddles. Check continuously to make sure the threads are in the right order on the right harnesses. Sley (thread) the reed in the beater, consulting the weaving pattern or design once more. Measure the reed from the center to space the warp threads in the middle. Using a sleying hook or very small embroidery hook, pull each warp thread through the dents (openings) in the proper sequence. Tie off the warp threads onto the front apron bar of the loom after removing the raddle and lease sticks. Tie off the threads in half-inch-wide bunches from the center outward, working on alternate sides as you go. Keep the knots loose and tighten them only when the tension is even. 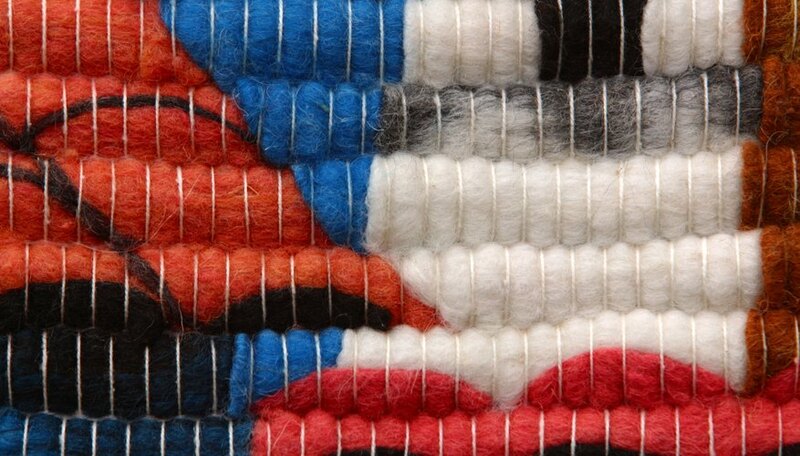 Start weaving with shuttled weft threads on your threaded loom after consulting the weaving pattern or design one more time. Use the glossary on the Glimakra website (see resources) to understand new weaving terms. Use a warping reel rather than a warping board if your weaving pattern calls for more than 12 yards of material. Remove animals and children from the weaving space while threading the loom as they may be a distraction. Always overestimate rather than underestimate the amount of yarn you’ll need for your weaving pattern or design. Jaqueline Girdner has written nonfiction and fiction since 1989, including articles, essays and recipes for publications including "The Eneagram Monthly" and "The Portable Writers Conference." She has published 16 mystery novels and now writes home and garden articles for eHow. Girdner holds a Bachelor of Arts from California State University-Hayward and a Juris Doctorate from the University of San Francisco.